Comprehensive Initial Exam - Mark T. Albers, D.D.S. Dr. Albers encourages his patients to maintain good oral health because this can help prevent future dental problems and because it contributes to a patient’s overall health. We start this process by scheduling all new patients for a comprehensive initial exam with Dr. Albers, even if they have been under the care of another dentist. Sometimes, we see a patient for the first time because of a dental emergency. When this happens, we treat the tooth or teeth causing pain and fix the immediate problem. Afterwards, though, we schedule the patient for an exam with Dr. Albers before additional routine care takes place. All new patients fill out a general information and medical history form. Although our office treats dental conditions, an understanding of each patient’s medical status helps us determine proper dental care and treatment. Necessary digital x-rays are taken. In some cases, this means a full series of x-rays (18). In other cases, especially if the patient has received regular dental care including x-rays, we obtain copies from the prior dentist or take a limited number during this visit. X-rays help us establish a baseline of oral health. They can show us early decay not visible during examination, evidence of infection, and evidence of bone loss associated with gum disease. After reviewing the medical history, x-rays, and asking the patient to identify areas of concern, Dr. Albers performs a thorough examination of each tooth. With the help of his assistant, they chart all restorations such as fillings or crowns, and they chart all missing teeth. 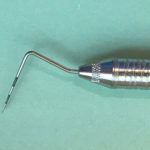 They make notes about defective crowns or fillings, any areas of decay, and cracks in the teeth that need monitoring. Sometimes these problems need immediate attention, while other times, Dr. Albers monitors the teeth, especially if they are asymptomatic. Next, Dr. Albers evaluates gum health using a periodontal probe. His assistant records these measurements and we refer to them during future visits. Dr. Albers also evaluates your jaw and your temporal mandibular joint (TMJ). He looks for signs of clicking, popping, or other dysfunction in the joint. He measures the opening of your mouth and evaluates your bite. The examination concludes with an oral cancer screening. Dr. Albers examines the throat, cheeks, and base of the tongue, looking for any unusual swelling or discolorations. He palpates the lips, cheeks, and lymph notes around the jaw, also looking for any unusual swelling or lumps. If he finds anything suspicious, he refers patients to an oral surgeon or other specialist for further workup. After completing the examination and oral cancer screening, Dr. Albers reviews his overall findings and recommendations for future care with the patient. Using an intra-oral camera, which projects an image of what Dr. Albers sees onto a screen for the patient to see, he can show them areas that concern him. Dr. Albers also discusses how patients can practice good oral care at home. Generally, Dr. Albers recommends that patients get their teeth cleaned twice a year. These cleaning appointments are important for several reasons. First, regular cleanings remove plaque and tartar from teeth. This helps patients maintain healthy gums and helps prevent decay from starting. Second, our team of experienced hygienists, along with Dr. Albers, carefully examine teeth and gums during cleaning appointments for evidence of decay, cracks, or periodontal disease. When these issues are identified and fixed early, more costly and involved procedures can often times be avoided. Our goal is to provide good quality dental care, educate patients about their role in maintaining good oral health, and prevent problems before they arise. Our comprehensive initial exam is our baseline for future care. Prevention is key!